According to the Russian defense minister, three new early-warning radars will begin combat operations in 2017 - Orsk, Barnaul, and Yeniseisk. In addition, three radars--Baranovichi, Murmansk, and Pechora--have been "upgraded." The radar in Orsk is of the Voronezh-M type. Barnaul and Yeniseisk are Voronezh-DM. The radar in Baranovichi (which is in Belarus) is an old one-of-a-kind Volga radar. The Daryal radar in Pechora is even older - it's one of the two original Daryal radars built in the 1970s. It will be eventually replaced by the new radar in Vorkuta (it appears that two radars are being built there - Voronezh-SM/77Ya-SM/77Я6-СМ and Voronezh-VP/77Ya-VP/77Я6-ВП). What Shoygu called the Murmansk radar is the old Dnepr/Daugava pair in Olenegorsk. Construction of new radar, probably of the Voronezh-VP kind, began there earlier this year. 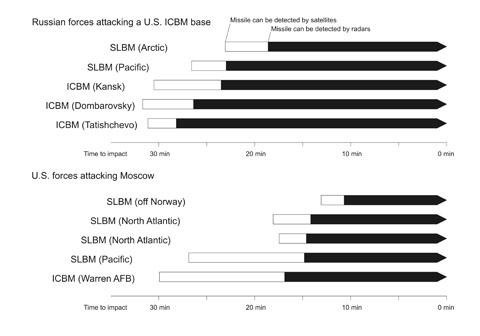 It shows that in some scenarios (SLBMs launched from the Atlantic), satellites don't add much to the warning time. And in any event, since Russia doesn't have forward-deployed radars, the radar warning comes to late to provide a useful check of the satellite information. To deal with the situation, the Soviet Union developed a different mechanism that allowed it to wait for signs of the actual attack (such as nuclear explosions) before launching its missiles. The arrangement is often referred to as the Dead Hand, since it does involve a certain predelegation of authority as well as the mechanism that ensures that decapitation does not prevent retaliation. The system, however, is not automatic (that idea was nixed in the 1980s) and requires humans to be involved in the decision to launch. With the improment in C3 means and the weapons itself - can't you launch silo based ICBMs in a LOW/LOA scenario with 10 minute warning? Happy new year to you and all here in the blog. Could we expect an update of the strategic forces overview this month? Thank you. Yes, I'll try to do an overview, but a bit later - January is a busy month.